The 12th match of the season was the best two between Chennai Super Kings and Kings XI Punjab, and the match is going to be interesting. Chennai Super Kings skipper MS Dhoni won the toss and elected to bowl first. The KXIP chased a fantastic score and gave a difficult target for Dhoni's squad. 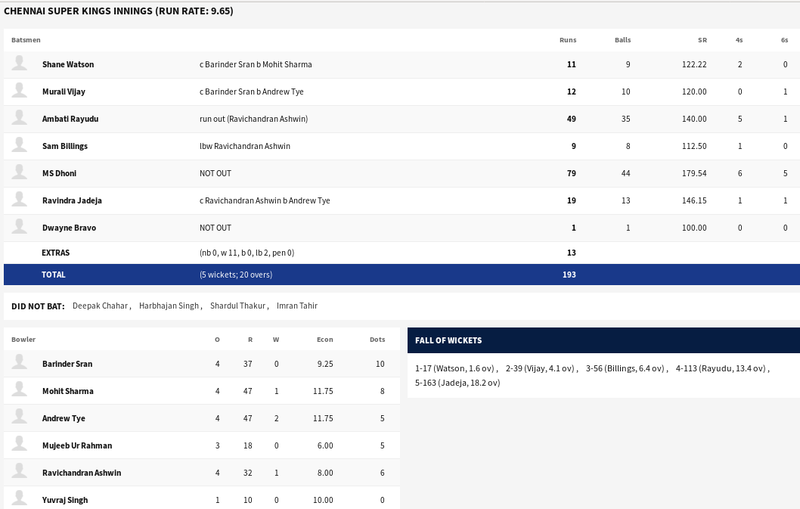 Well the CSK tried hard to chase the score but failed. The CSK chased the target in the last thriller overs. Chris Gayle becomes Man-of-the-match. KXIP's Lokesh Rahul came to bat first for the team along with Chris Gayle who played his superb with his bat and scored 63 runs until Shane Watson made him walk out. While Lokesh Rahul chased 37 runs. No other batsmen stood for long but played well to give to tuff competition. While CSK's scored Ambati Rayudu just one step back from half-century when he was run out by KXIP skipper Ravichandran Ashwin in 49 runs and Ravindra Jadeja scored 19 runs. MS Dhoni and Dwyane Bravo were unbeaten. MS Dhoni after giving the scare till the last to the KXIP said: "They bowled pretty well. Mujeeb you can say to a lot of extents was a major difference. It's not really easy to hit him at will. 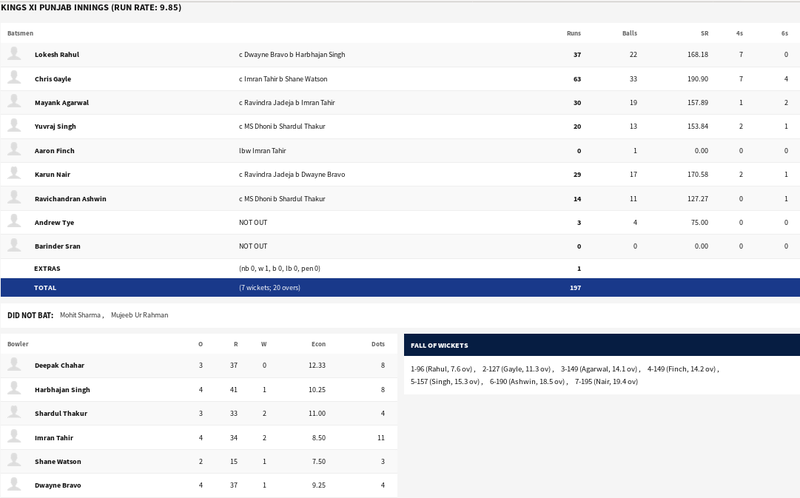 Overall I think Chris' (Gayle) innings and Mujeeb bowled really well. Overall they played better than us and we need to improve in a few areas."